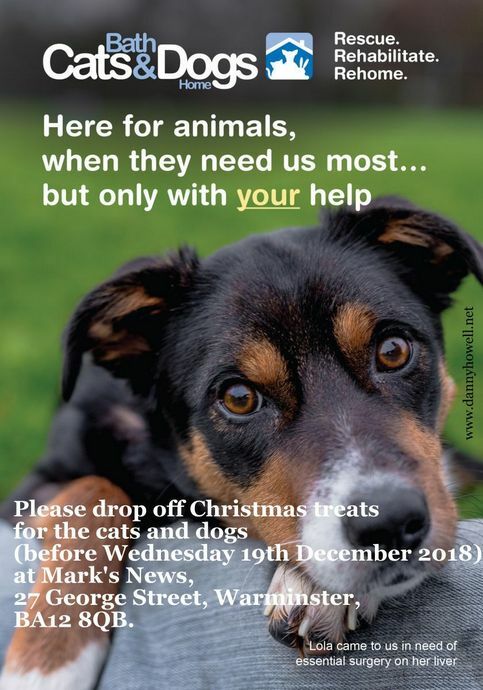 Mark at Mark's News, 27 George Street, Warminster, BA12 8QB, is collecting toys and treats for the dogs and cats at Bath Cats And Dogs Home this Christmas. He is also collecting treats for the staff and volunteers at the Home, to thank them for all the hard work they do throughout the year. Mark is also donating 10% from every pet item he sells in the shop to the same cause. People can drop off toys and treats at Mark's News up until Wednesday 19th December 2018, after which he will take them to the Cats And Dogs Home at the Avenue, Claverton Down, Bath. Mark can be contacted by telephoning 01985 218886.